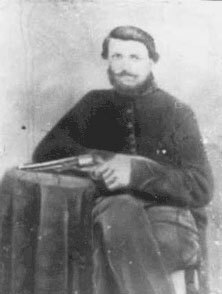 Ashley Lovett, being the only on of the three brothers to survive the war, was born December 5, 1835 in Winston Co., AL. He married Nancy Elizabeth Dickerson on August 5, 1866 in Marion Co., AL and had the following children: William A., born June 1, 1867; Alfred, born December 13, 1868; Frances M., born January 31, 1873; Andrew J., born November 26, 1874; Martha E., born March 10, 1877; James H., born February 16, 1879; Horace A., born February 16, 1879; Fountain Erascus, born September 29, 1883; Sarah Rebecca, born September 10, 1866; Louida, born April 19, 1890; George Washington, born August 16, 1892. After the war, Ashley farmed in Winston Co., AL where he died in Haleyville on August 19, 1918, having been married for over 50 years. His wife, Nancy, died August 31, 1934. Picture submitted by Dianne Miller.